Nebraska got things rolling in the right direction again on Saturday with a 27-17 win over Rutgers to open Big Ten conference play. Hail Varsity's Greg Smith, Derek Peterson and Jacob Padilla offer up three final thoughts from the victory. Survive and advance. Even against Rutgers, that should be the mantra for Nebraska the rest of the season. Lost in all the turmoil swirling around the program with Shawn Eichorst being let go and Mike Riley feeling a bit on an island, is that the team was incredibly short handed. Nebraska simply is too young and not at the point as a program that they can blow teams out being down several starters. With that being said, I thought Nebraska performed admirably in the game against Rutgers. There are still things to figure out, namely how to stop throwing pick-sixes but the defense continues to find its footing and play steady football. This is now a week-to-week proposition with this team and they need to continue building offensively before we can think they have a chance to get hot. I've come around on the idea of keeping Devine Ozigbo involved and thought he provided a nice spark. This staff just may have to give into Run the Ball Guy and use that recipe until Tanner Lee gains confidence and improves his decision making. So, let’s run through the timeline for a minute. The Huskers get gut punched to open the game against Oregon back on Sept. 9. They embark on a furious comeback in the second half only to fall just short. A week later, they lay an egg at home against a MAC school, promptly forcing the administration’s hand and costing Athletic Director Shawn Eichorst his job two days before they opened conference play. All the while, the outside noise for your head coach to be fired and your quarterback to be planted on the bench has gone from a murmur to a buzzing chainsaw. Did I expect to be saying “this is a can’t-lose game” during the week leading up to Rutgers? No, but that’s where we were and for, really, one of the first times this season, Nebraska buckled the chin strap and got ‘er done. 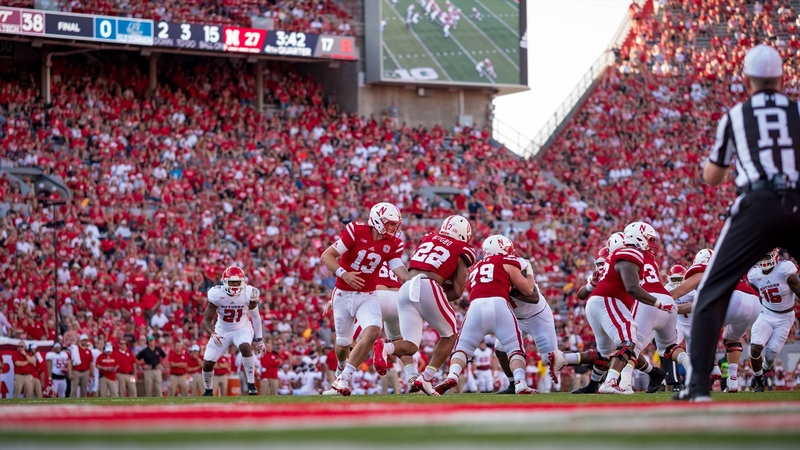 After the game, receiver Gabe Rahn used the word “resolve,” and Nebraska showed a ton of it on Saturday. Regardless of how you feel about Nebraska winning by 10 at home to Rutgers – shout out to you, forever unhappy Facebook guy – there were plenty of feel-good stories to be had in this one. Junior tailback Devine Ozigbo finally got his shot, after what coaches after the game said was a hard three weeks of practice, and rumbled for 101 yards on a career-high 24 carries. True freshman Brenden Jaimes started at right tackle because starter David Knevel and backup Matt Farniok were both out injured, and guess what, he didn’t get taken to task by the Scarlet Knights’ front line. Given how the offensive line as a whole has played this season, that’s a win in and of itself. Ditto for center Michael Decker who was replacing the injured Cole Conrad. Linebacker Luke Gifford continued to open eyes with his play. The Davis twins continued to show that front line for the Blackshirts might be the strongest part of this team. Redshirt freshman JD Spielman caught his first touchdown pass. See, lots of things. The one that stood out the most, though, was the talk of togetherness that seemed to come from everyone after the win. Go look at Chris Jones’ twitter feed, or Stanley Morgan's, or Drew Brown's. These guys are rallying around each other and their coach. Given how this week went, that’s even more impressive than going out and getting the win. Nebraska entered Saturday’s win against Rutgers already incredibly short-handed, missing seven players that came into the season as starters (including Chris Jones). Then, on the first drive of the game, junior safety Aaron Williams was ejected for targeting. Williams was one of two players that was on the field for every defensive snap last weekend and is Nebraska’s most experienced healthy defensive back. Last week, when Nebraska wanted to spell Williams or Antonio Reed or needed a sixth defensive back for their dime sub-package, Nebraska turned to redshirt freshman Marquel Dismuke. However, this time senior Kieron Williams finally heard his number called. Williams started nine games and played in all 13 last season as a key member of the defense, but this year Aaron Williams, Joshua Kalu, Antonio Reed and Dismuke had all earned snaps ahead of him. Williams was relegated to exclusively special teams snaps, playing primarily on the punt, kickoff and kick return units, but he embraced that role. Williams, who was fourth on the team in tackles and first in interceptions, did not record a stat on Saturday but even so he logged his highest snap-count of the season. Add Kieron William’s return to Derek’s list of feel-good stories.